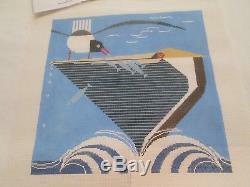 PELICAN PANTRY handpainted needlepoint canvas by Charley Harper. Image size 13 3/4" x 13 3/4". Stitch guide by Robin King. Mint condition and from a smoke free environment. The item "PELICAN PANTRY-CHARLEY HARPER-HANDPAINTED NEEDLEPOINT CANVAS-STITCH GUIDE" is in sale since Thursday, November 29, 2018.